Beyond CNC machines and tools, DATRON is now also offering the appropriate cooling lubricants (KSS). 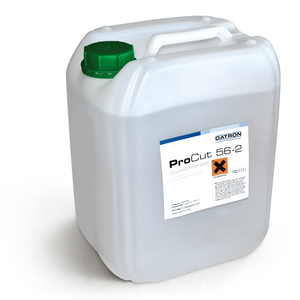 This new generation of cooling lubricants, called ProCut, is only appropriate for minimum lubrication (MMS). The ProCut KSS are characterised by very low consumption. In addidion, operating and personnel costs for the machine and part cleaning are saved to a great degree, as well as, for example, changing the lubricant. DATRON is still offering minimum lubrication systems for Microjet, which optimally moisten the workpieces with their flexibly adjustable spray nozzles.